This month I’m delighted to say that the farmhouse appears in Homes and Antiques magazine in all it’s Christmas glory. I’m sure it won’t surprise you to know that creating a stylish Christmas scene takes a little thought and planning, but how, where and what you may say. When interviewed for the article I was asked about my approach to Christmas styling and how I achieve my particular look. So as we approach the decorating season I thought it would be nice to share with you, a few simple styling secrets that I use when decorating my home for Christmas. I hope you might find some of these ideas useful when creating your own Christmas wonderland. The first thing I do is decide on a colour palette for my decorations. I will choose two to three colours maximum plus maybe a metallic and then stick to this throughout the house. In this scheme I chose, Teal, Berry and Burnt Orange, then added both gold and copper metallics. This creates cohesion and allows the scheme to flow effortlessly. Different colours in different rooms can be jarring to the eye and create a disjointed look. 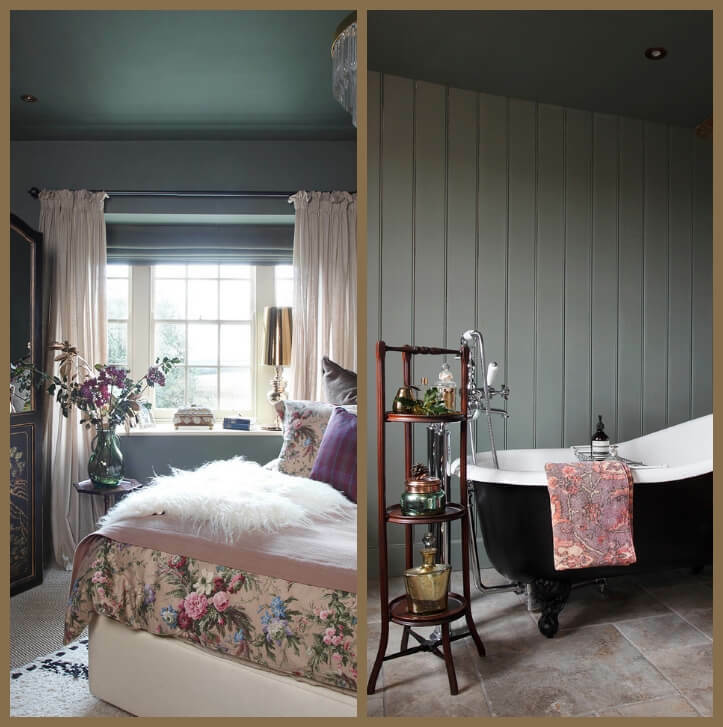 Too many different colour combinations can just end up looking a bit of a ‘hotch potch’, not the look I want at all! If I want to create distinction between rooms and areas I simply change the balance of the colours I’m using. So for example in the sitting room I used Teal and Orange, whereas in the Dining room it was predominantly Teal and Berry. 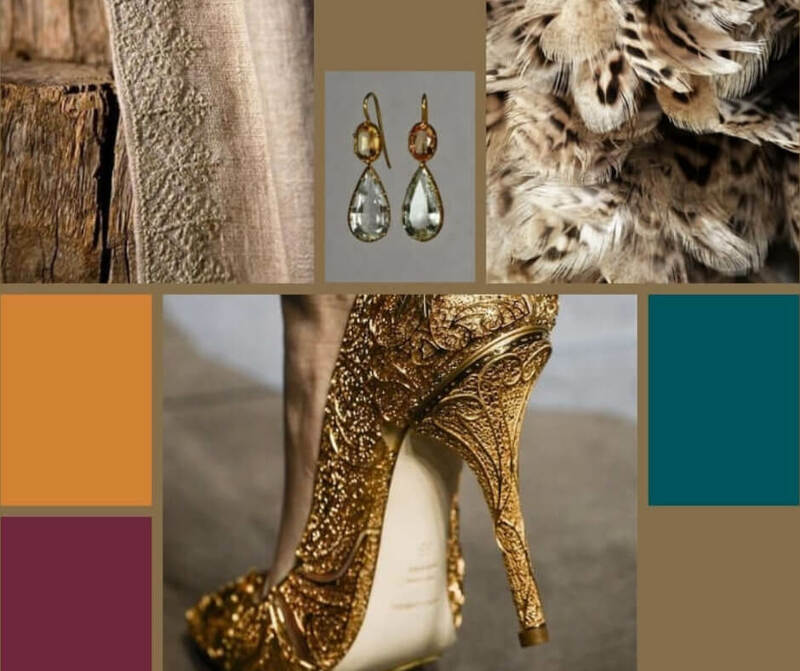 My Mood Board, Teal, Berry and Burnt Orange and Gold. 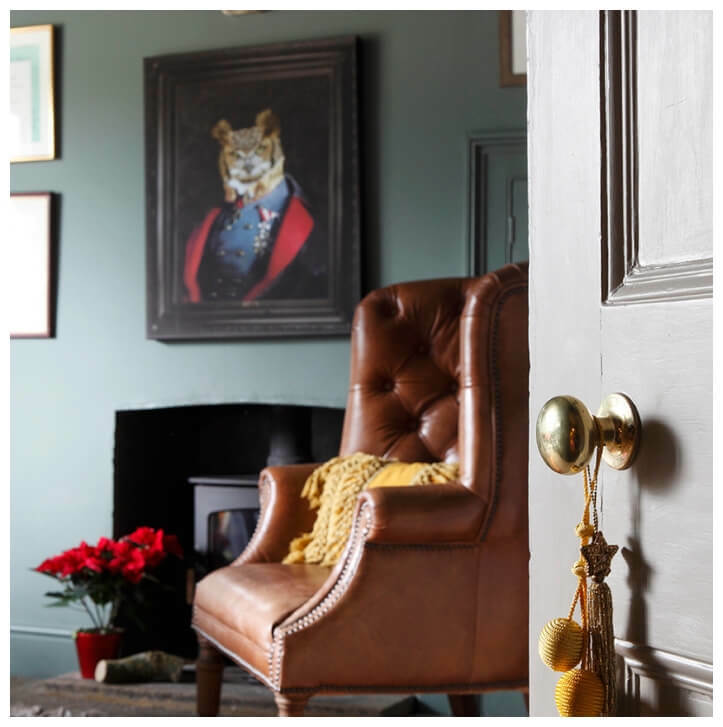 I find people can get a bit hung up on themes and feel they have to stick to a particular one, but because I stick to a colour combination and follow it throughout my home it allows me to successfully mix styles and textures because the colour holds the scheme together. This creates a far more interesting and less rigid look. It also allows me to reuse decorations from different years, sometimes different decades! 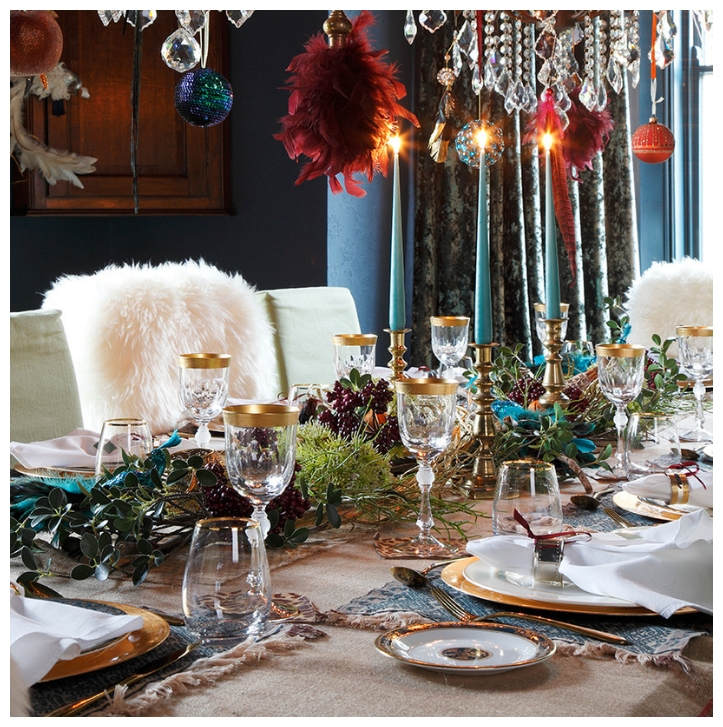 Here I’ve mixed luxe baubles, gold and crystal with a rustic a hessian table cover, foliage, feathers and birds for my special lived-in luxe feel. Its always nice to have one really show stopping element to the scheme, something a bit unexpected and the hallway and/or staircase is a great place to do this as its what people see immediately they enter, it creates excitement and interest. It was pompoms for me this year and coming up on my IGTV next week I’ve made a Video showing you how I put it all together, so keep an eye out for this and follow me on instagram for the heads up . There are some lovely colour combinations to choose from at Decopompoms or you could try a single colour and use different shapes and sizes to add interest, there are lots of options to make it personal to you. Although I like to make a statement, I don’t want to cover everything up with a mass of lights and tinsel. I love the things I have in my home and I want to enhance them, so adding festive touches, for example by highlighting the colours in a painting can be all that some rooms need. Less is often more. Its easy to just focus on the main living areas and whilst this is where I will concentrate my main efforts, I do also like to add little touches to bedrooms and bathrooms. Again this creates a sense of cohesion and continuity. So I add a little holly, or maybe a vase of festive foliage or something metallic and shiny. Finally, whilst I find a little planning goes a long way, I don’t take it all too seriously, I do like a giggle as you will know if we are in touch on the socials. Touches of humour and playfulness exist in my home already but I think Christmas is the perfect time to take it a step further. I absolutely love Christmas, its the perfect time to really let yourself go and create drama and magic! 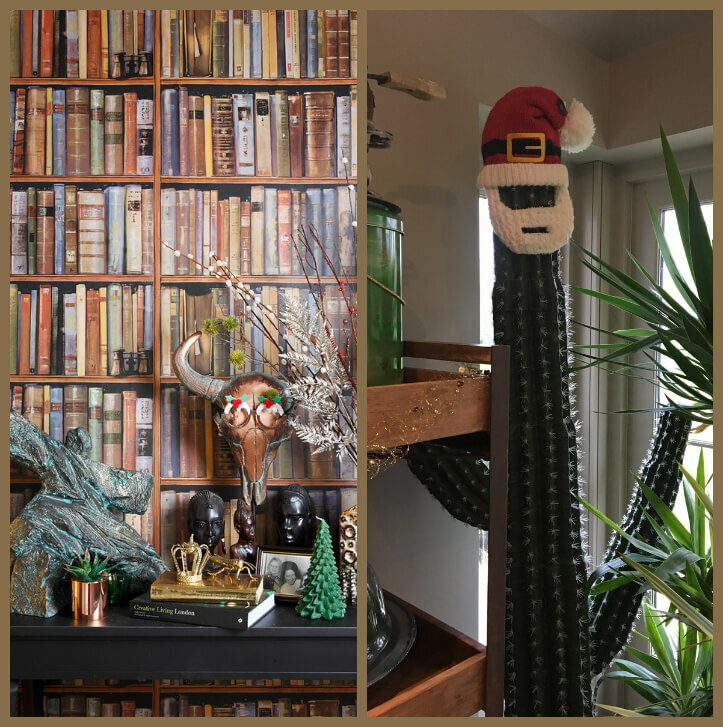 I really hope you will find some of these tips helpful when planning your Christmas decor and I’d love you to share your creations by tagging me on Instagram. 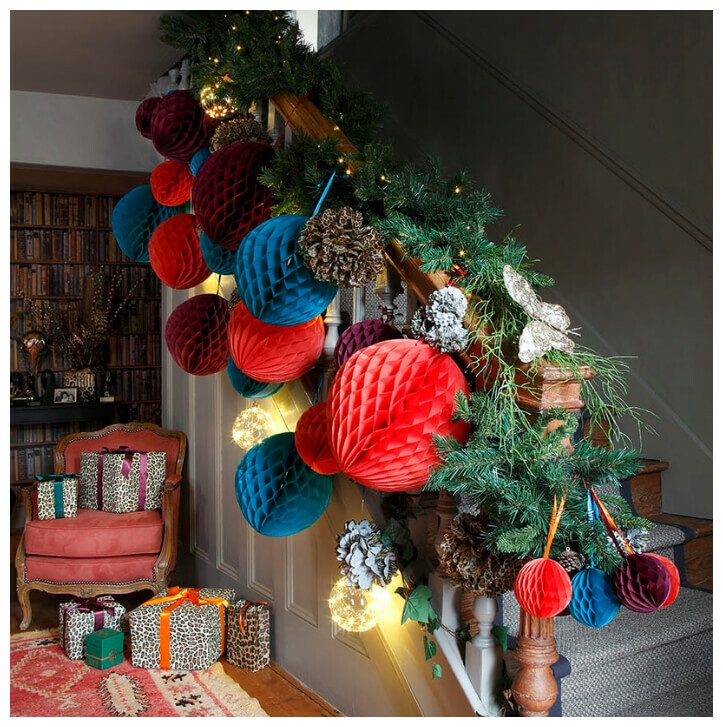 Keep a look out for the ‘step by step’ on how I created the staircase pompom feature.